Healthcare Ergonomics will help prepare workers with the knowledge and skills necessary to prevent and reduce worker injuries. 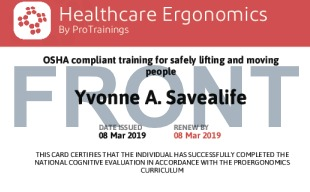 The course includes information on preparation, prevention, and how to safely lift and move people in various positions for one person, two people, and using a mechanical lift. 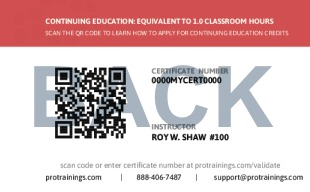 Total course time includes 1 hour and 13 minutes of video training as well as knowledge reviews, final test, remedial help and reviewing downloaded material.